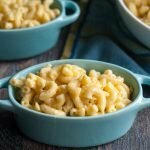 This is the creamiest white cheddar mac & cheese and you can make it in the Instant Pot! Creamy, cheesy and utterly delicious, this is a side dish your whole family will love! Fill the Instant Pot to the 4 cup line. Add in your macaroni, salt and butter. Press manual button for 4 minutes. Press the cancel button and take off the lid. Drain the pasta and put it back into the Instant Pot. Add the cheeses and cream and mix well until the cheese is all melted.